The Europa Regional Surveys of the World 2015 is a timely and authoritative reference source, vast in its scope. The set consists of nine volumes, covering all the world regions, from South Asia to North America. These can be purchased individually or together. 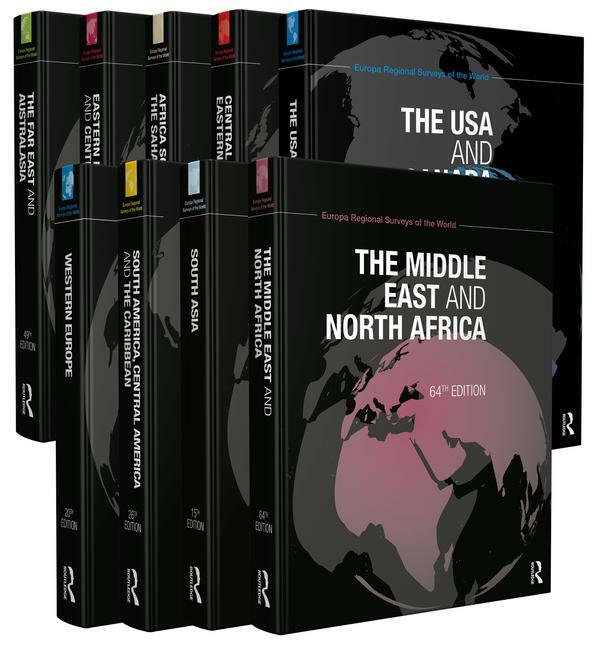 Each volume provides a vast range of background material, statistics, directory information and expert analysis of the social, political and economic situation for each of the individual countries within that region. Whether you want to source authoritative data on copper output in Chile, or gather information on the recent uprisings in North Africa and the Middle East, the Regional Surveys can be your first port of call. Users will also find useful directory information, including email and telephone numbers, for key contacts in government, finance, tourism, etc. Titles in the series: Africa South of the Sahara; Central and South-Eastern Europe; Eastern Europe, Russia and Central Asia; The Far East and Australasia; The Middle East and North Africa; South America, Central America and the Caribbean; South Asia; The USA and Canada; and Western Europe. - fully revised essay content, including new essays on the post-Socialist economies and on Islam in the region. - detailed coverage of political developments following highly significant elections in India, Afghanistan, Bangladesh, the Maldives and Nepal. - completely revised articles on political change in Latin America, violence and insecurity in Mexico, reassessing the war on drugs in Latin America and natural hazards in the Caribbean. - extensive coverage of the ongoing conflict between Government and opposition forces in Syria, and of the political and military crisis in Iraq. - new essays on Ghana, Nigeria, Mauritania, Mozambique and Uganda. - details of cabinet reorganizations and new heads of state in the region. - analysis of the tensions surrounding China’s territorial claims in the South and East China Seas. - coverage of the regional elections held in many territories of the Russian Federation in September 2014. - new material examining the challenges confronting indigenous peoples in the USA. Available in print and online, Europa's principal titles, The Europa World Year Book, The Europa Regional Surveys of the World, The International Who's Who and The Europa World of Learning, serve the contemporary research needs of students, academics and information-seekers in specialist and general reference libraries, government offices and commercial institutions in every country.